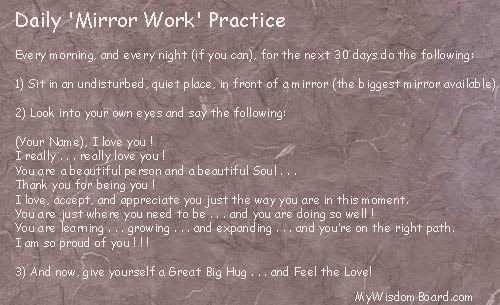 My Wisdom Board Blog : Mirror Work ! It is an incredibly effective technique to build self-esteem, self-love, and self-worth ! It has been scientifically proven that radiating self-love and self-care through the body-mind system activates beneficial hormones and boosts the immune system. So Go Ahead and try it . . . learn to Radiate Some Self-Love And Self-Care ! Here is a great Daily Practice you can try.